Stereotactic Body Radiation Therapy (SBRT) has been shown to provide favorable initial PSA response and remains an emerging treatment option for men with localized prostate cancer. Absolute PSA values 2 years post-treatment appear comparable or favorable to other forms of radiation therapy. Despite this, there is a paucity of literature that characterizes predictors for PSA decline 2 years post treatment. This study reports the effect of age and SBRT dosimetry on initial PSA kinetics for patients who have undergone definitive SBRT for localized prostate cancer. Between April 2, 2010 and January 15, 2016, 234 consecutive patients with localized prostate cancer were treated with definitive SBRT without the use of Androgen Deprivation Therapy. The median pre-treatment PSA was 5.6ng/ml (1.3-19.3ng/ml). Gleason scores were 6 (3+3) in 52.4%, 7 (3+4) in 27.0%, and Gleason 7 (4+3) in 15.5%, and Gleason 8 (4+4) in 5.6%. Based on NCCN risk categories, 47.9%, 46.2%, and 6.0% had low, intermediate, and high risk disease, respectively. The median prescription dose was 3500cGy (3500-3625) delivered in 5 fractions. The median age was 67 years (47-88) and the mean CTV size was 80.4cc’s (36.7-197.0). The mean D90 to the CTV was 3713.3cGy. Pearson's chi-squared test was conducted for univariate and binary logistic regression for multivariate analyses. At 2 years follow-up, the mean PSA was 0.4ng/ml (.006-192.5). PSA nadirs were <1.0ng/ml for 81.2% of patients; <0.5ng/ml for 56.0% of patients; and <0.3ngml for 35% of the cohort. 5 patients experienced biochemical failure by Phoenix criteria. On univariate analysis, age >60 (39.0% vs. 16.7%, p=.004) predicted for PSA <0.3ng/ml 2 years post treatment. CTV-based dosimetric predictors included D90>3700cGy (39.2% vs. 26.3%, p=.04), D75>3800cGy (40.5% vs. 26.2%, p=.02), and mean CTV dose >3900cGy (43.0% vs. 28.3%, p=.02). Pre-treatment PSA <10.0ng/ml also predicted this endpoint (36.6% vs. 18.8%, p=.05). 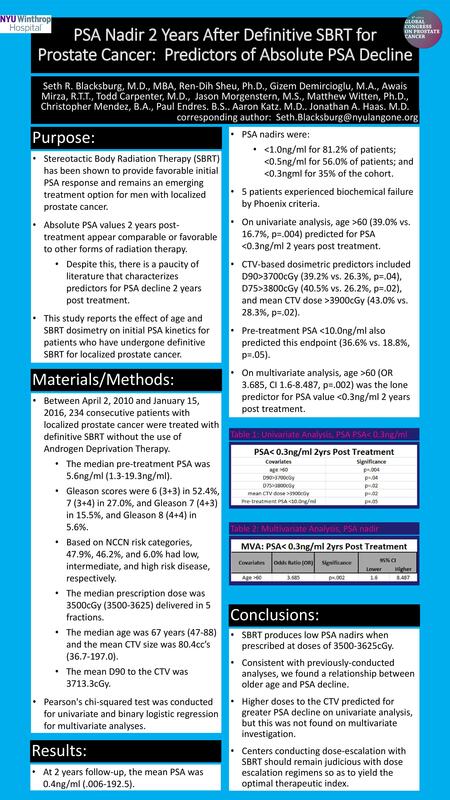 On multivariate analysis, age >60 (OR 3.685, CI 1.6-8.487, p=.002) was the lone predictor for PSA value <0.3ng/ml 2 years post treatment. SBRT produces low PSA nadirs when prescribed at doses of 3500-3625cGy. Consistent with previously-conducted analyses, we found a relationship between older age and PSA decline. Higher doses to the CTV predicted for greater PSA decline on univariate analysis, but this was not found on multivariate investigation. Centers conducting dose-escalation with SBRT should remain judicious with dose escalation regimens so as to yield the optimal therapeutic index.